One early morning I received a call from a friend who happened to be a married man. It was actually very early and when I saw he was the one calling I picked the call hoping it was not a bad news that he was about to relate to me. From his voice, I discovered that something very unpleasant was at stake; he had a fierce confrontation with the wife! I did not waste the next second as I drove straight to their house. On reaching their house, I offered some peace-activating prayers to them before listening to their respective stories. After listening to them, I discovered that it was just an argument (a very miniature one) but as none of them was willing to bend, it suddenly conflagrated into some feeling of bitterness on both parties. In fact, their relationship suddenly became pale with the exchange of uncharitable words. It took me a great deal of time to admonish, instruct, redress, and appeal to them to drop their hurts and to allow peace to have a way in their home. Each side had something “Big” against the other most of which were dug up from the infertile past. In the face of the rising temper, I assumed a sober disposition and suddenly a thought came to me. I began to recount the wonderful gestures of love they have invested for each other especially at difficult times and suddenly I saw myself emotionally drawn to give them a SIGN which brought about a suddenly reversal of the tension in the house! The SIGN I gave to them was effective and effectual; namely kneeling down before them. As I knelt down before them signalling for peace they too went down on their kneels in tears. Embracing each other, they spontaneously began to vouch for peace; they became reconciled to each other/. I later prayed for them and left with so much feeling of satisfaction; thanks to that SIGN (kneeling) which strongly evoked the peace they needed. Today we have SIGNS all over the readings both seen and hidden. To start with, in semiotics, a sign is something that represents another thing. Put in another way, a sign points to something other than itself. It can be natural for instance a smoke indicates fire, it can be conventional like traffic road signs which road users learn, it can be medical whereby it shows the presence of one illness or the other, it can also be religious or spiritual when it reveals the divine will or foretells a future event. In the First Reading today we encounter Ahaz, the King of Judah being told to ask for a SIGN. But he would not do so as not to put the Lord God to test. Among the Jews there is a special attention given to divine signs. Among the first of divine signs is the rainbow (Gen. 9:12-13). The rainbow is a SIGN from God which points to His covenant with His people and His decision not to destroy the world again by means of a flood. The evidence of divine presence / activity was often preceded by a SIGN. Abraham received a sign from God by means of the countless stars on the sky showing the greatness of his posterity (Gen. 15:5). Moses’ staff became a SIGN of God’s abiding presence for the Israelites in their struggle for liberation from the Egyptians as well as the pillar of cloud and pillar of fire (Exodus 4:2-4; 13:21-22). There are indeed many instances of SIGNS from the Old and the New testaments. Going back to Ahaz, we see a King who was in a helpless situation. Specifically he was besieged by two fierce enemies (Israel and Aram). The ultimate plan was the destruction of Jerusalem. Ahaz being told to ask for a SIGN was an invitation for him to make God his strength and hope. But he could not because his was already hanging his hope on the alliance he was forming with the Assyrians to fight back. From the above, we see a physical situation with a far reaching spiritual relevance. Ahaz here represents each and every one of us. The two enemies represent the devil and the world (see Eph. 2:2-3) and the target is Jerusalem which represents our souls. From this picturesque we understand that we are being besieged by the devil and the world. But we are being called by God to trust in him for our liberation. Like Ahaz some of us are more attentive to some help from somewhere apart from God; some foreign assistance, some kind of Assyria. 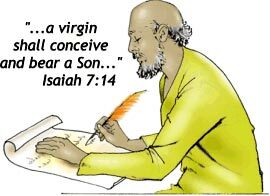 Through the oracle of Isaiah we are assured that God has an agenda for our situation and this will come about through a SIGN, namely that a virgin shall conceive and bear a son and he shall be called Immanuel (God-with-us). When the son is finally born unto us he will rule over our lives and he will be become for us Wonder Counsellor, Mighty God, Everlasting Father, Prince of Peace (Isaiah 9:6). Furthermore he will defeat those enemies and put them under his feet; he will overcome the world (John 16:33). The deepest and the highest SIGN is that of the coming of the messiah. It is from him that we have the great turn around and the salvaging of Jerusalem; our souls. Today the gospel reading draws our attention to the person of Joseph. Joseph stands as a great SIGN to all Christians. We can understand Joseph more when we place him side by side with Ahaz in the First Reading today. Both had puzzles confronting them; Ahaz contending with two enemies and Joseph contending with the fact that his bride-to-be (a virgin) was pregnant. However their approaches and reactions to their situations differed. Ahaz lost hope in God while Joseph trusted and obeyed. The gospel calls him a righteous man. We also can identify his humility, civility and obedience. For us Christians, Joseph stands as a productive guide and a SIGN to what God expects from us: attentiveness to the word of God, righteous living, trust in God, and obedience of faith as St. Paul recommended in the Second Reading (Rom.1:5) . On this last Sunday of Advent we are called upon to focus on those productive SIGNS that will take us finally to the messiah that will be born unto us in few days. It is one thing to identify a sign and another thing to follow that sign. We have been able to identify the faith and trust in God, we have been able to identify righteous living, we have been able to identify humility, we have been able to identify obedience; these should be allowed to characterize our lives as we in few days from now receive the new born King. Have an inspiring last Sunday of Advent and more bliss ahead.